Calling all swimmer/triathlete friends: I need your help. I figured this might be a good place to crowdsource some knowledge — not just for me, but for anyone else who finds themselves in a similar predicament. After almost 20 years (yep, dating myself there) of running, I’m mixing things up with more cycling and swimming — thanks, in large part, to the encouragement from my fellow Coeur Sports teammates. Throughout last season, my #bikelove blossomed — from learning how to clip in to completing an Olympic distance race to long group rides on weekends. But my #swimlove? Er, not so much. See, with running and biking I feel like the mechanics are pretty self-explanatory: one foot in front of the other, one pedal stroke at a time. Sure, we can shave off seconds and prevent injury by fine-tuning form and fitness, but once you have a grasp of the basics, all it takes is time and practice. Swimming, on the other hand, is not something that feels intuitive. At all. And although I took the obligatory swim lessons as a kid, I had to re-train myself to do laps last year. I can wrap my head around the movements — stroking, kicking, breathing — and get myself back and forth across the pool for 30-45 minutes, but there’s still something missing. 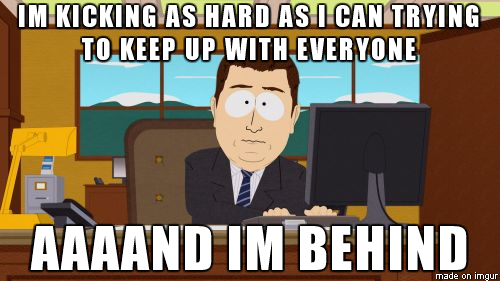 Basically, I feel like I’m not moving smoothly or quickly enough for how much effort I’m putting in. So my mission for 2015 is to figure this out once and for all, and — aside from knowing that I need some outside help — I’m not sure where to start. Step one is to whip myself into shape in the pool, then step two is to (eventually) translate that to open water. But how? I know I need someone to watch what I’m doing, tweak my form and help me worth with, rather than against, the water…but I’m stumped on the best approach: instructor vs. coach, personalized assessment vs. lessons from scratch, one-on-one vs. group, etc. At this point, I’m not looking to get primed for a specific event; I just need to train to be able to train, if that makes sense. But please don’t tell me to join a local masters program. I tried that in SF and got left in the dust with a group who said they were too slow to train with the actual masters group at that pool. Between getting lapped a gazillion times and dealing with smug looks from a Michael Phelps body-double, I’m not keen to try that again anytime soon. Runner seeking advice: I’m searching for #swimlove in 2015; can you help? I would be more than happy to help you! Swimming is my thing and I love spreading the #swimlove. If you want to send me a video I could get you started with a few drills and parts of your form to focus on. The main thing, I think, is getting your breathing down, which I would need to know how you currently are breathing. The best way to improve is to have someone personally analyze your stroke then have you focus on one thing at a time. There is so much that goes into swimming and it can get overwhelming. But I would have you start with one drill, master it, and then move on to the next thing. Cool, thank you so much; I’d love that! Next time I can get someone to the pool to tape me, I’ll send to you. Can you message me your email? I’m info (at) kineticfix.com. Appreciate it!! I’m also not a natural swimmer. Its been nearly six years and I haven’t hang of it, but I’ve tried a lot of things. Here’s what I’d recommend. The low cost way to start in with group class, but do your due diligence on the teacher. My first class was taught by some 17 year old kid who had no idea what to do with me. Find a class with a qualified and experienced teacher. If you have more to invest, a one-on-one instructor will do wonders. Just like Jessie mentioned, it’s great to have someone review your technique regularly. 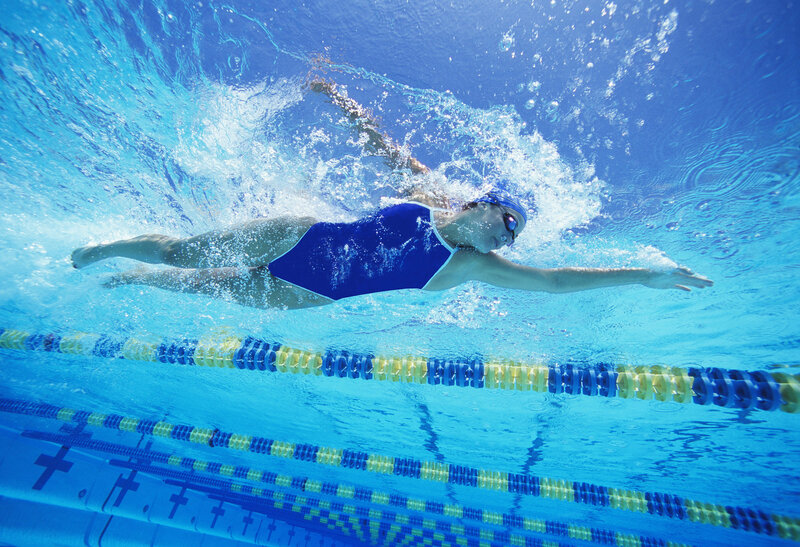 There’s so much to a good swim stroke, they’ll know what to fix first and how to help. Even seeing someone every other week could be beneficial. Also look around for other swim groups. At my Y, the local tri club works out once a week and their workouts aren’t crazy and there are plenty of people at all levels. I work out every Saturday with a tri group (not masters) lead by a local pro (and my coach). There’s plenty of us in the slow lane (even slower than me!!). Having a clear workout and people around you pushing hard really helps. Great advice! Will target my stroke first, and I love what you said about having a clear workout with a group to help push/motivate. Thanks!! I will agree with getting a coach, or at least someone who understands good mechanics to help you out at first. This will speed up your progress 10X. Swimming is all about form, and it is very difficult to figure out and feel on your own. Get someone to help you out, and your progress will be massive. Best of luck! Awesome; I’m reading these posts now! And agree – I know my form’s gotta be off, so time to call in an outside party to help troubleshoot. Thank you! I don’t advertise this publicly, but I am a USAT coach who has lots of training in the swimming arena. 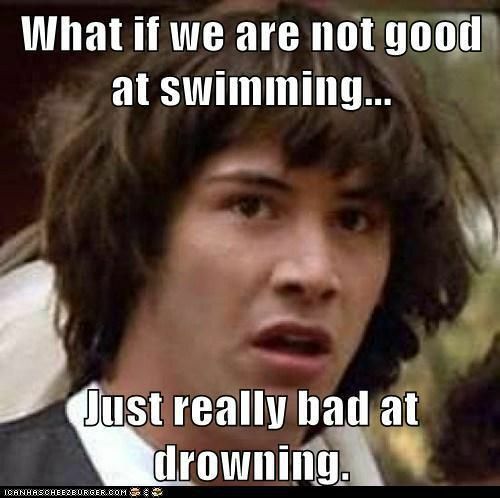 If you would send me a swimming video, I could analyze your swim stroke and give you some help. The key to making this a success will be to make sure that you are swim fatigued and that I have a couple of hundred yards of swimming to analyze from (multiple directions would help…side, head on and from the rear). Yes, yes, YES! Thank you for the generous offer! I will so take you up on it – as soon as Ben can get to the pool with me to tape. We’ll do a workout & I’ll have him tape me when I’m tired (which shouldn’t be too long…I started off around 2:00/100m the other day but you probably saw the end average was 2:24/100m so I’ve got to work on fitness in the water, too). A woman after my own heart on the masters front (I’ve learned time and again that it wasn’t for me). It looks like you’ve already gotten some great advice and I can’t say I’d suggest more beyond what’s already been said. I’m just wishing my husband had chosen Portland over Colorado Springs because I’d be more than happy to help you one-on-one to help with that efficiency. I’ve been swimming competitively since I was 12 (minus college where I was lucky if I got in the water once a month–and I lifeguard at SPAC) and taught adult lessons. You definitely want someone, whether it’s in person or via video, to take a look at what you’re doing above and below the water with your stroke. And then it’s drill drill drill, plus swimming more consistently so you really start to get the feel for the water. But yeah, as Kecia said, it’s all about nailing the efficiency. Once you get that, the speed will follow. I wish you guys were here, too! Well, if you’re ever in the area…please let me know (and vice versa) – not just for swim advice but to catch up, in general! Kicking myself that I didn’t swim more as a kid when it’s easier to teach your body better form, but you’re right – I’ll get in with someone & tweak my stroke. I think that alone will make me more excited to be in the water…right now it’s not my favorite! I started out as a non-swimmer and just like you I came from a running background. Apparently running really messes up your ankle flexibility which is a big deal in swimming! If you can’t point your toes well your feet are essentially braking when you kick. Kicking with fins is a good way to improve that. Wow, that’s so encouraging – thank you! Yep, I think if I can make some goals & progress it’ll motivate me to get in more often (right now, I’m lucky with 1x/week). And funny you say that about ankles – my trainer & PT both said my ankle flexibility isn’t great…so that’s probably a factor, too. Thanks again!